COMODO Disk Encryption is a free full-disk encryption program that supports encrypting internal and external hard drives, as well as building encrypted virtual hard drives. 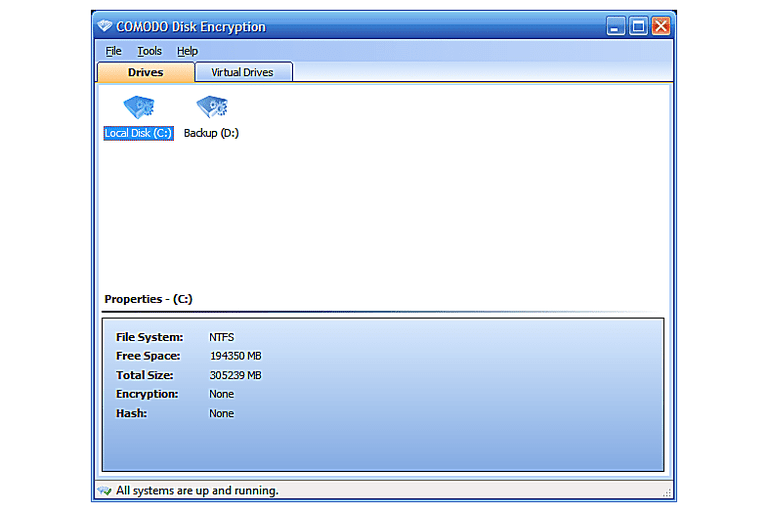 For added protection, COMODO Disk Encryption can even use a USB device as authentication. COMODO Disk Encryption was discontinued in 2010. This review is of version 1.2, which was the latest stable release. A beta version (v2.0) is also available and can be downloaded from COMODO's forum. Right-click the drive you want to use, and choose Encrypt. You're able to choose Password and/or USB Stick. You don't have to select both, but you are able to if you'd like extra security. Pick a hash and encryption algorithm. If you chose Password in Step 2, you'll be asked to enter a new password now as well. The option about ignoring free disk space is checked by default and can be left that way. If you entered a password in the previous step, and didn't choose USB authentication in Step 2, then skip to Step 5. Choose the USB drive from the dropdown that you wish to use as authentication. Hit Yes to start the encryption process. COMODO Disk Encryption is a nice program but only because of how easy it is use. Due to the fact that it lacks features like pausing, full support for USB devices, and the ability to encrypt more than one hard drive at once, I don't recommend this be your first choice when selecting a disk encryption program. However, if you're fine with those disadvantages, then by all means install COMODO Disk Encryption. Given that there isn't a huge variety of free disk encryption programs out there, it definitely doesn't hurt to use this one if there's something particular you like about it. COMODO produces some fantastic freeware software, like COMODO Backup, a free backup program, and COMODO Rescue Disk, a free bootable antivirus tool. I'm just not a huge fan of this particular product of theirs. I think COMODO Disk Encryption would be easier to recommend if were still being developed and it had some better features. However, as it is right now, I really think that TrueCrypt or DiskCryptor are better choices, assuming you don't want to use Bitlocker.